Throughout April, Keys visitors and residents can celebrate Earth Day with unique outdoor activities to be experienced only in the Florida Keys. This year’s Earth Day is April 22. Key Largo’s Reef Environmental Educational Foundation, or REEF, holds two Earth Day–related events in April. A monthly seminar set for Tuesday, April 10, is to feature University of Miami marine biology and ecology professor Martin Grosell discussing “In the wake of an environmental disaster – is there a silver lining?” The event begins at 6:15 p.m. at REEF headquarters, 98300 Overseas Highway, with complimentary appetizers, beer and wine and a 7 p.m. presentation. From 12-2 p.m. and 5-7 p.m. Thursday, April 19, shoppers at Whole Foods Market stores in Broward and Palm Beach counties can sample lionfish ceviche and learn how to filet lionfish at the stores’ seafood departments. Five percent of the day’s net sales in the two South Florida counties will be donated to REEF for support of the 2018 REEF Lionfish Derby Series, held throughout the summer in several Florida locations. The Key Largo derby is scheduled Friday through Sunday, Sept. 14-16, at John Pennekamp Coral Reef State Park. Visit reef.org or call 305-852-0030. In Marathon, Florida Keys Aquarium Encounters, where participants immerse themselves in a 200,000-plus-gallon saltwater tank, is to offer “Go Green and Save Green” encounter experiences on Earth Day with special-value tickets. A Coral Reef Regulator or certified dive experience is priced from $99 per person, while a Coral Reef Snorkel is priced from $89 per person. Stingray Encounter is priced from $45 per person, excluding taxes. The special values are valid Sunday, April 22. Tickets must be purchased on Earth Day; no advance purchases are allowed. Florida Keys Aquarium Encounters is located at 11710 Overseas Highway. Visit FloridaKeysAquariumEncounters.com or call 305-407-3262. 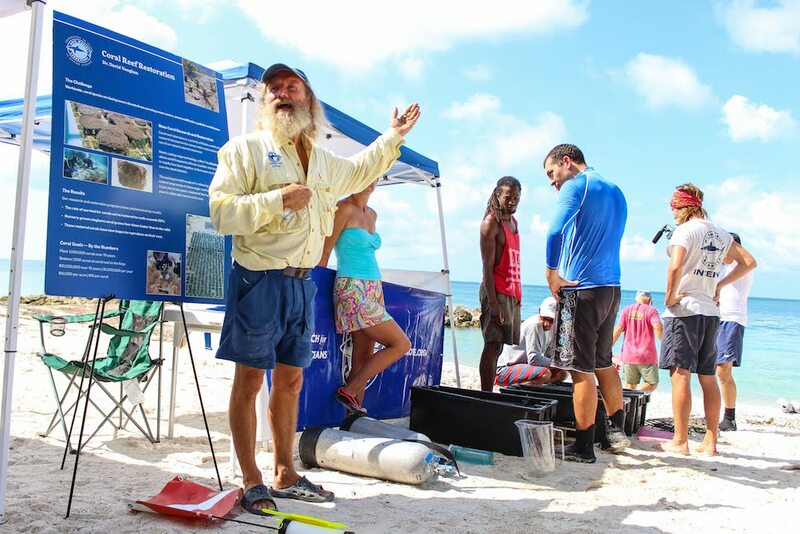 On Grassy Key, Dolphin Research Center is to sponsor the annual Tom’s Harbor Bridge Cleanup and Earth Day Celebration, scheduled 4:30-6 p.m. Thursday, April 19. Volunteers can collect and remove discarded trash, monofilament fishing line and other debris at Tom's Harbor Bridge at mile marker 62. Participants should bring a reusable water bottle, bug repellent and sunscreen. Water, scissors, trash bags, gloves and hand sanitizer are to be provided. Founded in 1984, the nonprofit Dolphin Research Center specializes in presenting marine mammal education and research programs to the public. Home to a family of Common bottlenose dolphins and California sea lions, the center is located at 58901 Overseas Highway at mile marker 59. For the bridge cleanup date and details, contact courtney@dolphins.org. For information about Dolphin Research Center, visit dolphins.org or call 305-289-1121. The 22nd Annual Earth Day 5K Run Walk Key West, sponsored by the Florida Keys Wildlife Society, the friends group for the National Wildlife Refuges of the Florida Keys, is to begin at 8 a.m. Saturday, April 21, at McCoy Indigenous Park. Participants can pre-register and pick up packets 5-7 p.m. Friday, April 20, at the park, located at 1801 White St. Pre-registration is priced from $10 to $15, with a free race T-shirt for the first 100 registered participants; registration is free for children under age 5. Earth-friendly recyclable awards await the top overall winners. Proceeds benefit the Florida Keys Wildlife Society. The event is co-sponsored by Key West Southernmost Runners Club. Visit floridakeyswildlifesociety.org/earth-day-5k or call 305-731-6362. Fort Zachary Taylor Historic State Park is to celebrate Earth Day in Key West with live historical re-enactments of life during the Civil War from 10 a.m. to 2 p.m. Saturday and Sunday, April 21-22, at the park’s Fort Zachary Taylor. Presentations include interpretations and demonstrations of weapons and camp life with costume-attired Union and Confederate soldiers, townspeople, craftspeople and performers who re-enact the period of 1861-1862. The educational re-enactments share the rich history of Fort Taylor, completed in 1866 as one of a series of forts built in the mid-1800s to defend the nation’s southeastern coastline. Fort Zachary Taylor Historic State Park is located at 601 Howard England Way. Visit floridastateparks.org/park/Fort-Taylor or call 305-292-6713. The Key West Turtle Museum is to host an Earth Day celebration Sunday, April 22, from 11 a.m. to 3 p.m. The public is invited to tour the museum, located at 200 Margaret St., to explore a new exhibit about sea turtles’ role in Key West’s unique history. Visitors can meet a young loggerhead sea turtle and staff from Marathon’s Turtle Hospital, which opened more than 30 years ago as the world’s first state-licensed veterinary sea turtle hospital. They also can discover ways to help keep beaches and oceans safe for nesting turtles with the Key West Sea Turtle Club. The museum showcases the history of sea turtle fishing in the early Florida Keys and emphasizes today’s conservation efforts. The free-admission facility is open Thursday through Sunday from 11 a.m. to 4 p.m. Visit keywestturtlemuseum.org or call 305-294-0209. The Key West Aquarium is to commemorate Earth Day Friday through Monday, April 20-23, with themed educational programs, creature “meet and greets,” scavenger hunts, games and prizes. Special Earth Day activities are scheduled for 11 a.m. to 4 p.m. each day. The aquarium opened in 1935 as one of the first family-friendly attractions in the Keys, and is open 9 a.m. to 6 p.m. daily. Children can touch small sea creatures and interact with them through a touch tank. Key West Aquarium is located at 1 Whitehead St. Visit keywestaquarium.com or call 305-296-2051. Mote Marine Laboratory’s Ocean Fest: A Community Celebration is slated for 10 a.m. to 6 p.m. Saturday, April 14, to celebrate the unique marine environment of the Florida Keys island chain. The free-admission event is to be held at Key West’s Truman Waterfront Park and the Florida Keys Eco-Discovery Center, a visitor facility for the Florida Keys National Marine Sanctuary at 35 E. Quay Road. Attendees can explore conservation and environmental exhibits, experience touch tanks, meet live marine animals, hear insights from Mote scientists and researchers, view and purchase works by local marine artists and craftspeople, and rock to live music. Marine life artist Wyland is to give painting demonstrations and auction his work to support the Keys’ underwater environment. In addition, two free fishing clinics are planned for children. Proceeds support coral reef restoration and research programs of Mote, a nonprofit research organization based in Sarasota, Florida, with a field station on Summerland Key. Visit moteoceanfest.org or call 305-809-4750.